Let's look at some more Comic-Con pictures! These are all from Friday, July 21st. Friday was a big day for The Tick at Comic-Con. I got to the convention center a little bit early to line up for autograph tickets. Like the last few years, the weather in San Diego was a little warm, but luckily it was pretty mild and overcast this morning. The line to get into the Sails Pavilion snaked outside of the building and all over the place. There's still plenty to see in line, I guess. This was one of my favorite costumes from the show, from the new Doom Patrol series! As in previous years, once the line started moving, I was able to get through it pretty quickly and get the tickets I was hoping to get. Most people were trying get tickets to a Justice League cast signing, so it was mostly smooth sailing for everyone else. After leaving the Sails Pavilion, it was back to the show floor. This Dr. Fate costume was probably the best of the show. I love the light-up eyes. Here's Marge Simpson at the Bongo Comics booth! And that's a Frank Miller sighting. The day before, I got tickets to the Gerard Way/Gabriel Ba signing at the Dark Horse booth. Way is the lead singer of My Chemical Romance as well as a comic book writer, so there were lots of weepy fans crowding around. They were signing posters for the new Umbrella Academy series that's coming to Netflix soon. Here's a very flattering picture of both of us. This is Marceline from Adventure Time, right? I'm going with it. Lego Flash has an interesting codpiece. Here's the ubiquitous comic convention Chewbacca appearance. Great costume! I'm not sure if this Han Solo was specifically modeled after Freddy Mercury, but I really enjoyed it. It's been said that Elvis designed one of his 1970s jumpsuits after Captain Marvel Jr., so it was awesome to see this mashup. Beetlejuice doesn't really seem that out of place with Skeletor and Evil-Lyn. I wasn't crazy about the Watchmen movie, but these costumes are great. In the early afternoon, it was time to head back to the Sails Pavilion for the Tick autograph signing. This guy was rocking this great Tick mask. Obviously, getting to talk with the people behind The Tick was a big highlight of the show for me. This was my first time meeting a number of these folks. Everyone in line got a poster. Griffin has been practicing that Arthur artwork, I can tell. Right after getting out of the Tick line, I hopped a few rows down and got into an autograph line for Milo Murphy's Law, the Disney cartoon starring "Weird Al" Yankovic, who was there with two of the show's creators. This was announced at the last minute, so I think this flew under the radar for a lot of people. While I was in line, Samm Levine from "Freaks and Geeks" and "Wet Hot American Summer" showed up! I didn't expect to see Al at the show, so it was a nice surprise. I got to give him and the show creators some UHF enamel pins that I had made for the convention. 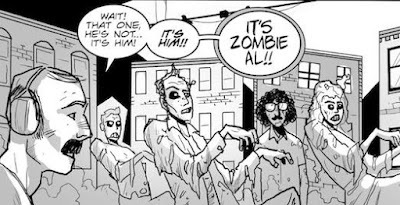 It must be weird seeing your face on fan-made items, but Al is always a friendly, easy-going guy. I hope he liked it. After I got out of THAT line, I ran straight to the Tick panel. I unintentionally snuck into an exit door for the room. I was by myself at this point, so I was able to find a single seat right up in front. The panel started about five minutes after I arrived. I cut a lot of things close this day, but it all worked out, which was a relief. The second episode of the Amazon show streamed at the panel, about a month before anyone else got to see it, and the cast followed it up with a Q&A. The room was packed by the time it all started. There were a lot number of Tick family members in the audience as well. I saw Jackson Publick after the panel ended! Team Tick members must have had some free time later in the day on Friday, because I saw a number of them on the convention floor before the show ended. I gotta get me one of those shirts! The show ended about an hour after the panel let out, so I walked the floor for the rest of the day. Friday was a great day for costumes. This Luke Cage is classic. The guy really sells it. You don't see many J Jonah Jameson costumes out there. Kudos to him with the prop. I think the new Spider-Man costume is pretty good. Nothing beats the original, but I like it. Here's The Tick and Arthur, once again! These guys are really dedicated to the property. They show up in these costumes every year. And that is it for Friday! It was a VERY busy day. Lots of fun! More to come. The first half of The Tick season one is now streaming on Amazon! I hope that you've all had a chance to watch it (maybe more than once?). It's been incredible for me to see it all take shape, as someone who's right on the periphery of this thing, so I can only imagine how unbelievable this has all been for those directly involved in the production. What's surprised me more than anything is the sheer scope of Amazon's promotional push for this show. The Tick is being advertised on billboards, in subways, on television, online - seemingly everywhere. It's very interesting to see this project that I've been a small part of show up in a lot of mainstream places over the last few months. Let me put it this way - my mom has seen ads for the show, so you know it's a big deal. For today, I wanted to take a little bit of time and talk about some of the promotional items that Amazon has released for the show. A lot of this comes from Comic-Con in San Diego, so thankfully I was able to get a little bit of a head start on getting all of the items you see above. But there have been other Tick items released in the last few weeks and I've managed to get my hands on some of them. I didn't realize how much was out there until I tossed it all together. Let's take a peek at what we've got! One of the biggest items is the backpack/swag bag that was given out in San Diego. Maybe "Team Tick" members wore these around the city to hand out different items. It's pretty similar to a lot of the comic convention bags you'll see at any given show, except this one is 100% Tick branded. Here's a view of the back and the arm straps. I had to search online to find this guy - the t-shirt. 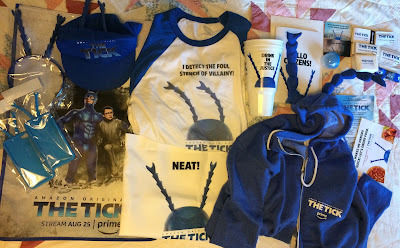 When I went through the Tick activation site at SDCC, they were out of shirts and I had to go for the tote bag instead. This guy is a full XXL size, so I won't be wearing it any time soon. These were printed on site once you finished the scavenger hunt. Here's the aforementioned tote bag, which does look pretty good compared to the shirt, I think. As with the shirt, there were a few different slogans you could choose to have printed on it. If you're wondering "does this mean you have to get every different iteration of every printed item? ", the answer is, "I hope not". That way lies madness. There were two slightly different phone cases handed out in San Diego: one for the iPhone 6 and 6s, and another for the larger iPhone 7. This is one of the coolest looking items, I think, and also one of the least functional. The promo winner at Comic-Con was, not surprisingly, the antennae headband. I saw a lot of people wearing these throughout the show. The hat is also something you can wear on your head, and I saw some people wearing it, but not as many as the headband. I think I've managed to grab all of the little handouts from SDCC, either in person or online afterwards. Near the top are the, I guess, hygiene products, including moist towelettes, sunscreen, deodorant (really) and tissues. The rectangular shaped box in the middle contains something, but I have no idea what it is. I have no plans to open it, but it's nothing obvious. Perhaps it will remain one of life's mysteries. At the bottom of the picture, you can see two handbills advertising the show and different promotions associated with it. I picked these two things off the ground and the one on the left shows some wear, probably from 10,000 people stepping on it before I got to it. Directly above is the RFID-chipped elastic wristband that everyone who went through the outdoor site had to wear. At the very top are two different business card-sized ads, one about costuming and the other about...punching. I'm particularly happy that I managed to get this item. This temporary tattoo (I think) was part of the bathroom setup at the interactive zone outside of Petco Park. If you flushed the toilet, one of these plastic bubbles rolled down into a basket. I was lucky to get one with a blue cap (there were all different colors in the enclosure) to fit with the theme. Soon after Comic-Con, Carl's Jr. ran a small promotion with their extra-large-sized drink cups. Carl's Jr. is run by the same company that owns Hardees, except one is on the western part of the country, and the other is on the east. As far as I can tell, Hardees strangely did not have the promotion (not in my general area, anyway), so I was lucky to have someone grab these and mail them to me. This is the other side of the cup! A few days ago, I saw a picture of X-Men actor Oliva Munn wearing a clearly-branded Tick jacket with antennae on the hood. Who wore it better? Uh, okay, probably Munn. But I was able to grab this once I saw it pop up on eBay a little while ago. It took me a few days to figure out just where it came from. It turns out that Amazon sent these as part of a press packet to reviewers of the show. Is it a bribe? I don't know, but it sure is soft. The second part of that packet was the actual show on DVD. It came in this neat-looking booklet. The booklet has images from the series posters and a short writeup about all of the main characters. Near the back of the booklet, there are short bios for the actors and producers of the show. Notice that Griffin Newman is, for some reason, referred to as "the Moth". There are a few items that I'm still on the lookout for, some of which I'll probably never get. There was a drink koozie with a screen printed image given out at the activation site - I could have gotten that instead of the tote bag, but I think I picked the better of the two. 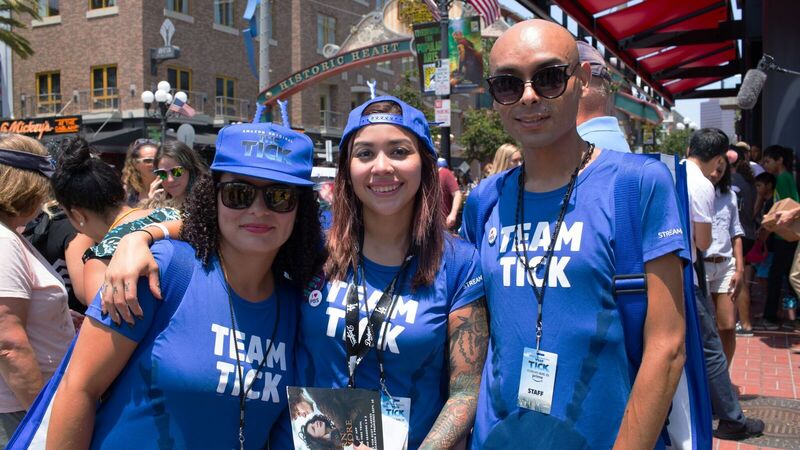 As you can see in the picture directly above, members of "Team Tick" - those hired to work the event - all got event-specific t-shirts to wear. I've yet to see any surface online since Comic-Con. I should have made an offer to one of the workers before the show ended, but I didn't realize they'd be so tough to find (and "sell me your shirt!" is a weird conversation starter). I have hopes that I'll be able to get one at some point - I know I'll be on the lookout for someone wearing it at the New York Comic Con in October, where the Tick will have a presence as well. A week before the first handful of episodes were made available to stream online, Amazon had a premiere in New York City - where the show is filmed - and the setup was just incredible. I had some friends attend, and the pictures they posted looked really fantastic. Among some of the props outside of the theater, where they screened the first three episodes, were "Tick Tacs", blue-colored takeoffs of the popular breath mints. From what I gather, they were there for the taking (if you could get behind the velvet rope). I also saw branded popcorn bags and lots of props which were probably not removable. Needless to say, I'd do just about anything to be able to grab some of those, but I have to imagine that it'll be very difficult to do so. I think my whole point in posting this is to say "wow, look at all of the neat promo items Amazon is putting out for The Tick!" Hopefully my astonishment is made clear enough, because I'm really quite taken back by it all. Now I'm off to do another futile search for a Team Tick shirt!